Mary Mulcahy launched Les Indiennes in 2002. She had a vivid picture in mind of naturally dyed cotton, with airy patterns of big, single colored motifs. But unable to locate such fabrics anywhere she decided to create her own. She found a craftsman named Srinivas in a tiny village in southern India. He is one of very few craftsman who still practice the ancient art of kalamkari- the complex printing method used to produce Les Indiennes fabrics. The production of our fabric does not cause pollution nor does it disrupt the traditional lifestyle of the village where it is made. 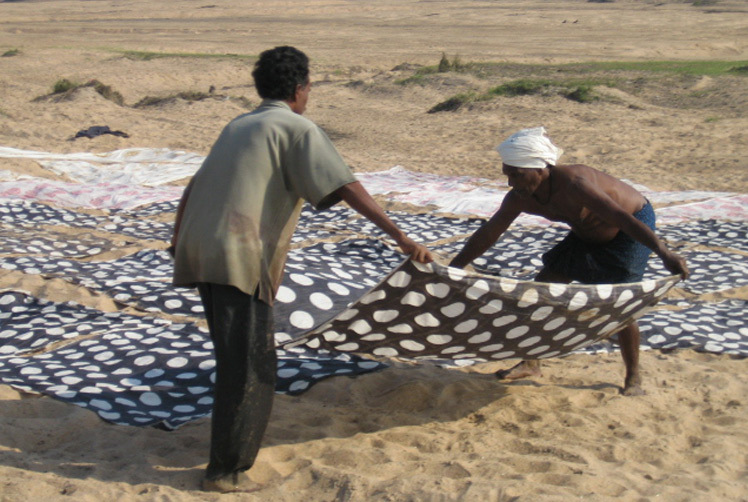 Les Indiennes provides fair trade employment for numerous families, raising the standard of living for the entire community, and all the while leaving no environmental or social footprint. The fabric must initially be softened and bleached. Bales of organic cotton are repeatedly rinsed and beaten against large rocks, then laid out on the grass to bleach in the intense Indian sun. If it rains, this step must wait. Once the fabric is sufficiently softened and lightened, printing begins. Craftsmen dip hand-carved teak blocks in dyes derived from plants, roots, earth and rock. Great care must be taken in pressing the pattern to the cloth. Then, the printed fabric is air dried for at least two days. When the fabric is dry, it must be steamed over a fire of rice chaff to fix the color. Workers next haul the cloth to a stream and rinse the fabric to remove excess dye. Colors emerge from different streams in different tones – nature’s little tweak! With all of these careful steps, it is not surprising that Les Indiennes fabrics arrive beautifully broken-in and soft.